This peak is #60 on the Height List for New Mexico . 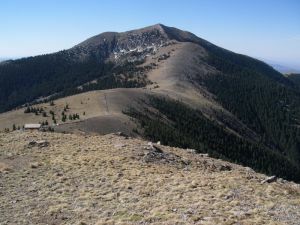 This peak is #1 in Prominence List for New Mexico .A high, gentle peak in south-central New Mexico. The summit is an easy scramble from a developed ski area just north of the mountain. Sierra Blanca Peak is the highest point in the southern half of New Mexico, and is one of the southernmost points at which alpine ecosystems occur in the United States. Rising 8000 feet (2400 m) above the adjacent Tularosa Basin, it has the highest prominence in the state, and is the southernmost high peak in the contiguous United States (all higher peaks are further north). The peak can be seen for many miles, particularly within the Tularosa Basin, and is visible from as far away as Sandia Crest near Albuquerque. Much of the southern half of the range, including the summit of Sierra Blanca Peak, is part of the Mescalero Apache Indian Reservation, and requires a permit for access.